The “Combatants for Peace” is a group of Israeli and Palestinian individuals who were actively involved in the cycle of violence in that part of the world, but are now committed to resolving the conflict through peaceful means. They are calling for the establishment of two states that will co-exist peacefully – the Palestinian State and the State of Israel. When the group began three and a half years ago, there were 11 members, and now there are over 500 people who regularly participate in all the peaceful events and activities. The seeds of peace are certainly developing fast. 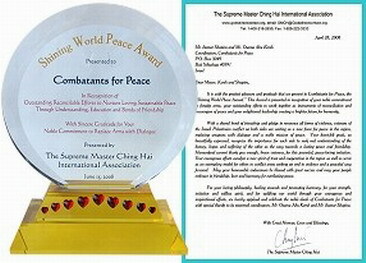 Supreme Master Ching Hai honored the Combatants for Peace with a Shining World Peace Award for their courageous, noble and gracious leadership, and peace-loving efforts to improve our world. On July 26, Golden Year 5 (2008), Israeli Association members traveled to Aram, near the eastern side of Jerusalem. There they visited the offices of the Combatants for Peace to present the commemorative plaque on behalf of Supreme Master Ching Hai to the Israeli and Palestinian organizing committee. Upon arrival, the committee considerately prepared and offered an authentic and delicious vegan meal to our group, complete with hummus, falafels, tahini, vegetable salad and pita bread. They then took us to witness the situation of the two divided nations, and how it devastatingly affected each side. Later, we learned that each side had paid a heavy price for being in conflict, making them realize there is no other way but peace. In such hostile situations, the common reaction seems to be hatred, revenge, anger and fear. But the Combatants for Peace made a conscious decision by refusing to go down that path and instead chose the righteous and harmonious way of forgiveness, understanding and respect. We are delighted that both sides have chosen the road of peace and solidarity, and we wish them much prosperity and fulfillment. Such a brilliant example of brotherly love that we all can learn from, that will most assuredly bring more love and harmony into our precious world.